PENCILLERS: Ilias Kyriazis, Michael Dialynas. Cover by Nick Runge. After being defeated by the ghostly villain Koza’rai, the boys in gray each find themselves trapped in a different time period. 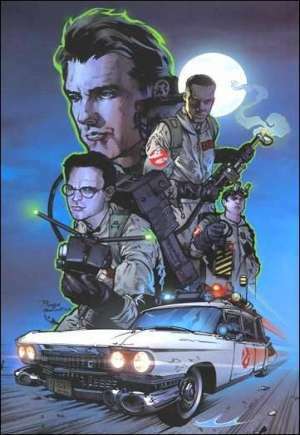 Their only hope is Rachel Unglighter, a student of Egon’s, who travels back in time to reunite the team and save the world. This book is pretty accessible to Ghostbusters fans young and old. The story almost writes itself. And with Peter trapped in the old west, Ray trapped in the days of King Arthur, etc, the jokes do too. That’s unquestionably the hardest part of the Ghostbusters movies to replicate on to the page: that comedic camaraderie Murray, Aykroyd and the others put into it. How do you channel the genius of Bill Murray? You can’t. You simply have to do your best. That’s the thing about the GB miniseries’ that have come out in recent years (to coincide with the 25th anniversary of the first film). In my opinion, they’re only as good as their Venkman. Did Aykroyd create the concept? Yes. Did he and Ramis write the films? Yes. But the Peter Venkman character (along with Sigourney Weaver’s character, Dana Barrett) was what injected some reality into them. He was the healthy cynic. In essence, he was the Han Solo of Ghostbusters (I think that means Egon was C-3P0). So as a writer, the closer you can come to generating something along the lines of Murray’s performance, the better your story is going to be. I don’t think Scott Lobdell comes incredibly close in that regard, but he does a decent job. For my money, the best Ghostbusters graphic novel out there is Legion by Andrew Dabb. From an artistic standpoint, Displaced Aggression is pretty “cartoonish,” but I can live with that. At the end of the book, Michael Dialynas pencils a short story about what Janine (the Ghostbusters’ secretary) was doing while the main story was taking place. His style looks a little more “comic bookish” to me. But then again, who am I to say what looks cartoonish or comic-bookish? The real question is, if Janine can get in the book, why can’t Louis Tully? In the end, this book was fun for me because I’m such a ghosthead. But I can recognize that it doesn’t recapture the magic of the films. And that’s okay. It’s doesn’t look like The Real Ghostbusters cartoon, and the creators’ hearts are in the right place. For me, the latter is what matters most. Image 1 from bleedingcool.com. Image 2 from protoncharging.com. This entry was posted in Comic Books/Graphic Novels and tagged Bill Murray, comic book reviews, comic books, Dan Akyroyd, Egon Spengler, Ghostbusters, Ghostbusters: Displaced Aggression, Harold Ramis, IDW Publishing, Ilias Kyriazis, Janine Melnitz, King Arthur, Louis Tully, Michael Dialynas, Peter Venkman, Rob Siebert, Scott Lobdell, Sigourney Weaver, time travel, trade paperback reviews on 04/06/2010 by primaryignition.